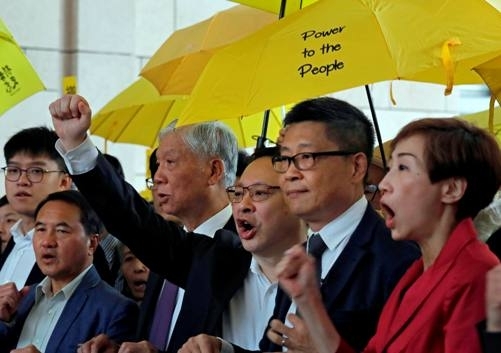 Hong Kong, Nov 19 (IANS) Three of Hong Kongs most high-profile democracy activists on Monday pleaded not guilty to charges of public nuisance for their involvement in the 2014 street protests. Sociology professor Chan Kin-man, 59, law professor Benny Tai, 54, and baptist minister Chu Yiu-ming, 74, face up to seven years in prison if convicted for encouraging the protests that became known as the 'Umbrella Movement' and called for direct elections for Hong Kong's leader, a position that is in effect appointed by Beijing. The three formed "Occupy Central with Love and Peace" in 2013, saying if the government did not deliver universal suffrage the following year they would take to the streets, reports The Guardian. They eventually merged their group with student protesters, lead by Joshua Wong, and spent 79 days camped out in front of the government headquarters. But the protests did not lead to any changes. In the four years since the protest, freedoms in Hong Kong have been dramatically curtailed, with the government aggressively targeting pro-democracy activists with what some say are politically motivated prosecutions, barring candidates from standing for election, removing popularly elected members of the city's legislature and banning a fringe political party. Last month, the government expelled a Financial Times journalist for hosting a talk on the topic of independence, the Guardian said. Hundreds attended the trial of a total of nine activists on Monday. Amnesty International Hong Kong said the trial was "an act of retaliation aimed at silencing the pro-democracy movement".